1. Untruthfulness, rashness, guile, stupidity, avarice, uncleanliness and cruelty are a woman's seven natural flaws. 2. To have ability for eating when dishes are ready at hand, to be robust and virile in the company of one's religiously wedded wife, and to have a mind for making charity when one is prosperous are the fruits of no ordinary austerities. 3. He whose son is obedient to him, whose wife's conduct is in accordance with his wishes, and who is content with his riches, has his heaven here on earth. 4. They alone are sons who are devoted to their father. He is a father who supports his sons. He is a friend in whom we can confide, and she only is a wife in whose company the husband feels contented and peaceful. 5. Avoid him who talks sweetly before you but tries to ruin you behind your back, for he is like a pitcher of poison with milk on top. 6. Do not put your trust in a bad companion nor even trust an ordinary friend, for if he should get angry with you, he may bring all your secrets to light. 7. Do not reveal what you have thought upon doing, but by wise counsel keep it secret, being determined to carry it into execution. 8. Foolishness is indeed painful, and verily so is youth, but more painful by far than either is being obliged in another person's house. 9. There does not exist a pearl in every mountain, nor a pearl in the head of every elephant; neither are the sadhus to be found everywhere, nor sandal trees in every forest. 10. Wise men should always bring up their sons in various moral ways, for children who have knowledge of niti-sastra and are well behaved become a glory to their family. 11. Those parents who do not educate their sons are their enemies; for as is a crane among swans, so are ignorant sons in a public assembly. 13. Let not a single day pass without your learning a verse, half a verse, or a fourth of it, or even one letter of it; nor without attending to charity, study and other pious activity. 14. Separation from the wife, disgrace from one's own people, an enemy saved in battle, service to a wicked king, poverty, and a mismanaged assembly: these six kinds of evils, if afflicting a person, burn him even without fire. 15. Trees on a riverbank, a woman in another man's house, and kings without counselors go without doubt to swift destruction. 16. A brahmin's strength is in his learning, a king's strength is in his army, a vaishya's strength is in his wealth and a shudra's strength is in his attitude of service. 17. The prostitute has to forsake a man who has no money, the subject a king that cannot defend him, the birds a tree that bears no fruit, and the guests a house after they have finished their meals. 18. Brahmins quit their patrons after receiving alms from them, scholars leave their teachers after receiving education from them, and animals desert a forest that has been burnt down. 19. He who befriends a man whose conduct is vicious, whose vision impure, and who is notoriously crooked, is rapidly ruined. 20. Friendship between equals flourishes, service under a king is respectable, it is good to be business-minded in public dealings, and a handsome lady is safe in her own home. To read the translation of all the chapters of Chanakya Neeti In Hindi you can navigate to the following link which has the compilation of all the chapters in Hindi. 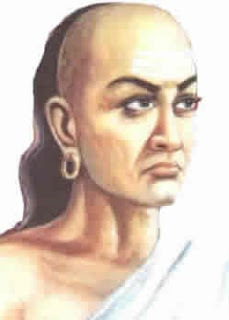 Note: Some thoughts of Chanakya may be offensive to women, or to Hindus born in so called low caste. I believe in complete equality between man and woman and we detest the Hindu caste system. We have decided to publish his thoughts exactly as written by Acharya Chanakya. We apologize to women, and to anyone else, who may be offended. Complete List Of Best Hindi Quotes & Slogans- सर्वश्रेष्ठ हिंदी अनमोल विचारों और कथनों का विशाल संग्रह! !